The term ‘sales funnel’ can be quite deceptive, whether used in the context of a business-to-business (B2B) or business-to-consumer (B2C) setup. You see, it creates the idea that businesses have access to a barrage of customers that will simply fall through the “funnel” and move on to the final sales stage. Needless to say, it doesn’t work that way at all. It is possible for customers to get stuck somewhere along their journey through the funnel and it actually happens more often than we’d like to imagine. However, the funnel is our best way of looking at the customer journey, from unawareness to the final sale. Now, the sales funnel has given birth to several other buzzwords. For instance, we have the “prospects” that enter the funnel. Then, we “accelerate” them towards the final sale. These are just a few of the keywords we use to describe every step of the customer’s journey within the funnel. The B2B sales funnel is no different from any other funnel. We use it to guide the customer from the top to the bottom using content that creates awareness at the top of the funnel and closes the deal at the end of it. But, do we really know of the exact stages in between or what the customer’s pain points/requirements are at each stage? This is a scenario that can be harder to figure out when you’re dealing with another business as your customer. Business customers are complex and they have multiple considerations and touch points. Customer Relationship Management or CRM, as we already know, is the name for a collective of strategies designed to manage the relationships that a company builds with its many customers. A CRM system or software is what helps us manage those relationships. It’s the technological medium that simplifies things and makes the whole process easier to track. A CRM system aimed at B2B organizations should be able to parallel your sales funnel and play a key role in the sales strategy. It should help B2B businesses identify and track opportunities throughout every stage within the sales funnel. More importantly, it should help you address the issues that causes leads to exit the funnel. Today, B2B-oriented CRM systems offer something called “opportunity stages.” They refer to the various measurable and trackable phases that the sales process can be categorized into. Typically, there are around 6 stages. Stage 1, where the prospect accesses the content and initiates the next step. Stage 2, where the prospect conducts an ROI assessment. Stage 4, where they are provided with a proof of concept. 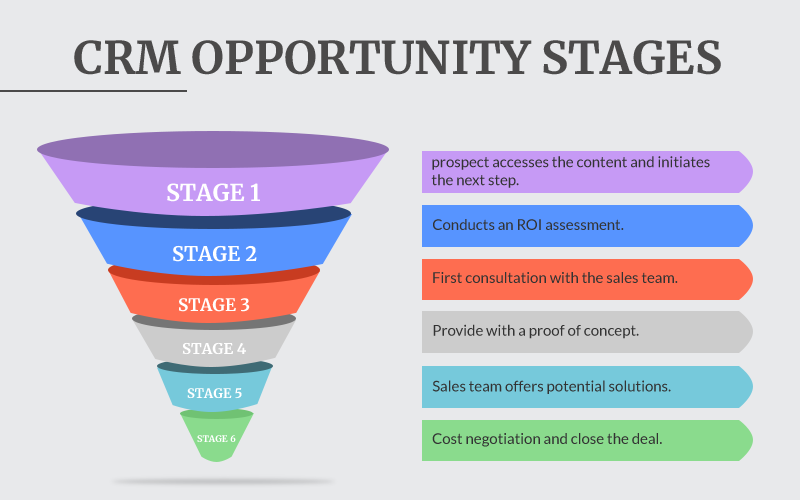 Stage 5, where the sales team offers potential solutions. Stage 6, where they negotiate the costs and close the deal. Now, things will vary from firm to firm, but the general principles stay the same. The key is to make sure your CRM is able to be “in sync” with each opportunity stage. This will help your B2B business nurture leads till they reach the final stage. Finally, when the client is ready, you must be able to guide them at every step from thereon. The efforts to align marketing with sales should be simplified as well. A fully-integrated CRM solution will help you keep a track of campaign effectiveness in order to keep you informed about where those quality leads were sourced from. To cut a long story short, your B2B CRM solution should give you a clear idea as to where each prospect fits in the funnel.